Hey everyone! After a few days of my computer deciding to take a brake, and me getting out of nail art funk, I finally had the chance to do some swatches. 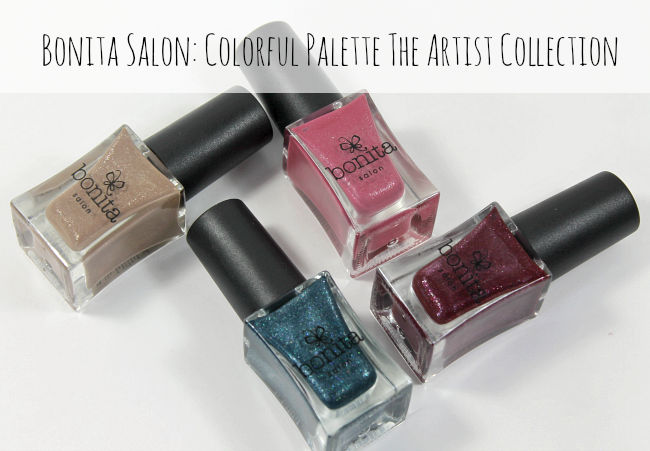 For today's post I have Bonitas Salon Colorful Palette The Artist collection, perfect shades for the Fall/Winter season! Starry Night- (my fave) a gorgeous deep teal blue with tons of holographic shimmers, throughout the polish. I would definitely recommend this one, as the shimmers and color are completely beautiful to wear. The formula was pretty normal, as the application was amazing! This was fully opaque with one coat...YES one coat, sealed with top coat. For the design, I really wanted to embrace the upcoming winter. Although it is not snowing yet in New Jersey. 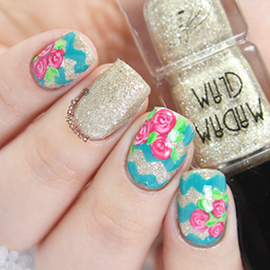 This is definitely the perfect shade to for some snowflake decals from Winstonia Store. Monet's Garden- a rosy pink shade with subtle of shimmers, throughout the polish. Not a color I would normally go for, maybe my mom. Definitely a soft shade for the winter. The formula was slightly on the thick, even slightly difficult to apply. On the upside, I only needed to apply one coat for full coverage. 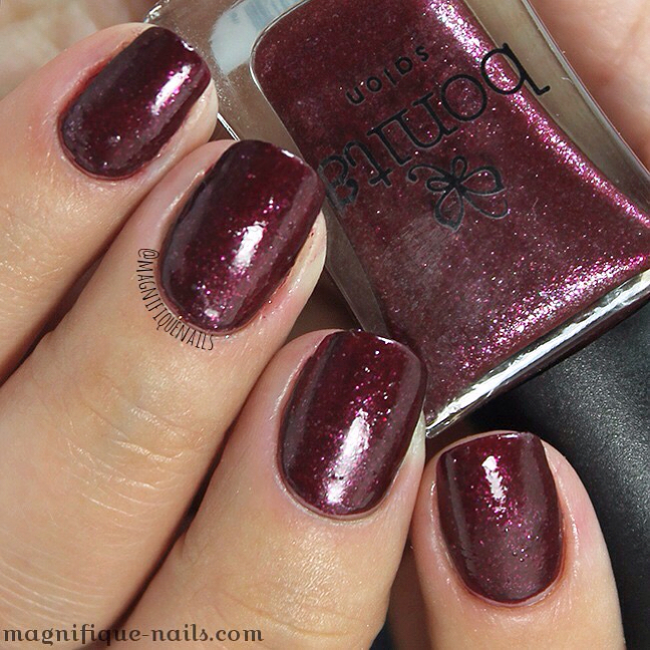 Rembrandt's Muse- (second fave) is a gorgeous deep cranberry red with tons of shimmers, throughout the polish. The formula on this polish was normal and the application was fairly easy to apply. This was fully opaque with one coat, sealed with to coat. This is another color I would definitely recommend! Sigh* when it comes to red shades, I can't help to accent it with gold. After seeing one of my top favorite bloggers, Kristen from Lacquerstyle, YouTube elegant floral video I just had to recreate it! Da Vinci Code- a medium chocolate brown with subtle of gold shimmers, throughout the polish. I for one would not go for many brown shades, but this shade is one I would favor most for this season. The formula, unfortunate, was slightly thick. On the upside, I only needed to apply one coat for full coverage. Overall I was a little disappointed with the thickness on some of the polishes, however the application was fairly good and workable. Mostly as these are one coaters. They all dried a stain like finish, however, applying top coat will give that glossy look. You can purchase Bonita Salon polishes in Rite Aid stores or from their website for $3.99 a bottle. For updates and awesome giveaways (which their having one now), follow them on the their social medias: Instagram: @bonitacolors Facebook: Bonita Cosmetics Twitter: Bonita Colors Tumblr: Bonita Cosmetics Hope all of you enjoyed my post today! What do you guys think? Let me know in the comments below!